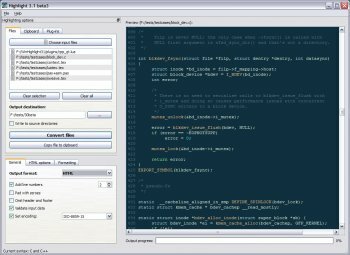 Highlight is a universal source code converter which transforms code to HTML, XHTML, RTF, LaTeX, TEX, SVG and BBCode files with syntax highlighting. (X)HTML and SVG output is formatted by CSS. It supports customizable color theme and language descriptions with regular expressions. The configuration files are Lua scripts with plug-in support. The tool contains several options to provide a consistent formatting of the output code.